Continuing the examination of deviations between the text of Codex Sinaiticus and the Byzantine Text in the Gospels, let’s look today at some meaningful differences the two in the Gospel of Luke. In Luke, Sinaiticus’ text differs from not only the Byzantine Text, but from virtually all other manuscripts, with great frequency – but usually the differences do not drastically affect the meaning of the sentences in which they occur. The list of translatable differences between the text of Codex Sinaiticus (À) and the Byzantine Text exceeds 100, but I chose the following 60, not just in the interest of brevity, but also because they make it especially obvious that the text of Codex Sinaiticus is different not only in its wording, but in its meaning. ● 1. In Luke 1:26, is Nazareth located in Judea, or in Galilee? ● 3. Does Luke 1:65 say that people spoke of all these things in the hill-country of Judea? ● 4. At the end of Luke 2:14, does the angel say, “Peace on earth; goodwill to men,” or “Peace on earth to men with whom God is pleased”? ● 5. According to Luke 2:37, how many years had Anna been a widow? ● 6. Does Luke 2:43 refer to Joseph and Mary as His “parents,” or as “Joseph and His mother”? ● 7. In Luke 2:44, did they look for Jesus among His kinsfolk and acquaintances, or are only his kinsfolk mentioned? ● 8. In Luke 3:1, in what territory did Pontius Pilate serve as governor? ● 9. Does Jesus’ genealogy in Luke 3:32 mention Boaz and Salmon, or Balls and Sala? ● 10. In Luke 3:33, was Adam the father of Admin? ● 11. Does Luke 4:4 include the phrase “but by every word of God”? ● 12. Does Luke 4:5 say that the devil took Jesus up on a high mountain? ● 13. In Luke 4:8, does Jesus say “You get behind me, Satan”? ● 14. Does Luke 4:18 include the phrase “to heal the broken-hearted”? ● 15. In Luke 5:14, did Jesus tell the healed leper to show himself to the priest? ● 16. Besides tax collectors, did others sit down in Luke 5:29? ● 17. Does Luke 5:38 include the phrase, “and both are preserved together”? ● 18. Does Luke 6:17 mention people from Perea? ● 19. Does Jesus say in Luke 6:44 that people do not gather grapes from a bramble-bush, or that people do not gather grapes from a sprout? ● 20. In Luke 6:48, did Jesus say that the house “was well-built,” or that it was “built upon the rock”? ● 21. In Luke 8:37, where was the multitude from? ● 22. Does Luke 8:40 say that the people in the crowd were all looking for Jesus, or that they were all looking for God? ● 23. Does Luke 8:47 include the statement that the women saw that she was not hid? ● 24. Does Luke 8:47 say that the woman told the crowd why she had touched Jesus? ● 25. Does Luke 8:54, referring to those who mocked, mention that Jesus put them all out? ● 26. Does Luke 8:55 say that the girl who had been dead arose immediately? ● 27. Does Luke 9:7 describe Herod as a tetrarch? ● 28. Does Luke 9:10 mention Bethsaida by name? ● 29. 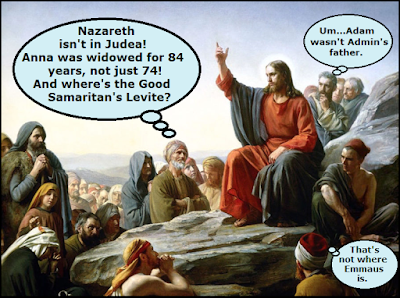 In Luke 10:32, does the Parable of the Good Samaritan include a Levite? ● 30. At the end of Luke 12:37, did Jesus say that the master, when he comes, will serve his faithful servants? ● 31. Does Jesus say in Luke 12:39 that the master of the house would have watched if he had known when the thief was coming? ● 32. In Luke 12:52, did Jesus say that there shall be five in one house divided? ● 33. Does the ruler of the synagogue say in Luke 13:14 that it is fitting for man to work six days a week? ● 34. Does Jesus say in Luke 13:25 that some people shall stand outside when they ask for the door to be opened? ● 35. In Luke 14:15-16, does someone say, “Blessed are those who shall eat bread in the kingdom of God”? ● 36. In Luke 15:13, does Jesus mention that the prodigal son wasted his wealth on riotous living? ● 37. Does Luke 16:16 say that everyone is pressing into the kingdom of God? ● 38. Does Jesus conclude Luke 17:9 with the comment, “I know not”? ● 39. In Luke 17:10, does Jesus make a statement about what should be done when everything that was commanded has been done? ● 40. In Luke 17:12, does Luke mention that the ten lepers stood afar off? ● 41. In Luke 17:35, does Jesus say that two shall be grinding; one shall be taken and the other shall be left? ● 42. In the parable in Luke 18:11, does the Pharisee in the temple pray “with himself”? ● 43. Does Luke 18:24 report that Jesus became very sorrowful? ● 44. In Luke 20:23, does Jesus ask a question? ● 45. In Luke 20:28, did the Sadducees mention the qualification about a man dying childless? ● 46. In Luke 20:30, did the Sadducees specifically say that the second brother took the woman as his wife, and died childless? ● 47. In Luke 21:8, does Jesus predict that many will come and say, “The time is near”? ● 48. Does Luke 22:6 mention that Judas made a promise? ● 49. In Luke 22:53, did Jesus tell those arresting Him, “This is your hour”? ● 50. Does Luke 22:64 mention that Jesus was being struck on the face? ● 51. In Luke 23:5, did the people say that Jesus had been teaching throughout all of Judea? ● 52. In Luke 23:42, did the repentant thief address Jesus as “Lord”? ● 53. Does Luke 24:1 report that the women at the tomb had some others with them? ● 54. In Luke 24:12, did Peter see the linen clothes lying by themselves? ● 55. According to Luke 24:13, how far was Emmaus from Jerusalem? ● 56. Does Luke 24:27 say that Jesus explained all of the Scriptures about Him? ● 57. In Luke 24:31, does Luke say that when the two travelers’ eyes were opened, they knew Him? ● 58. Does Luke 24:42 say that Jesus ate a piece of honeycomb? ● 59. In Luke 24:46, does Jesus say that it was fitting for the Messiah to suffer? ● 60. Does Luke 24:51 say that Jesus was carried up into heaven? As was the case with the comparisons between the Byzantine Text and the text written by the copyist of Sinaiticus in Matthew and Mark, my purpose is not to show which text is better; it is to show that they are different. The doctrine of inerrancy is difficult to maintain when one’s text says that Nazareth is in Judea. And if one uses a text that does not contain Mark 16:19 and Luke 24:51b, one must concede that Jesus’ bodily ascension is not reported anywhere in the Gospels. In addition, many things are said in the Byzantine Text that the text written by the copyist of Codex Sinaiticus does not say – it is not a matter of conveying the same thing in different words; it is a matter of losing data. At some point, readers should be asking, “How reliable is the text of Codex Sinaiticus?” A longer list of its unusual readings would demonstrate that it is more unreliable than the average medieval Byzantine manuscript – but to just give some idea of its unreliability: red dots that accompany a listing indicate that À disagrees not only with the Byzantine Text, but also with the Nestle-Aland compilation (41 out of these 60 entries).